Today we are happy to announce the release of Vision Helpdesk V3 Mobile beta version. The mobile version can be accessed on all smart phone browsers. The V3 mobile beta version is available for testing on our cloud server. Existing V3 beta testers can access mobile version by simply visiting their Vision Helpdesk url in their mobile browser – example if you have V3 beta signup at url — http://demo.visionhelpdesk.net then simply open below url to access manage portal url for mobile version. If you haven’t signup for V3 beta – then first signup for V3 beta here.. Mobile browsing experience is improving day by day – with your favorite browsers like FireFox, Opera & Skyfire are already in a race to take mobile browsing to a next level. Mobile browsers are optimized so as to display web content most effectively for small screens on portable devices. Mobile browser software must be small and efficient to accommodate the low memory capacity and low-bandwidth of wireless handheld devices. 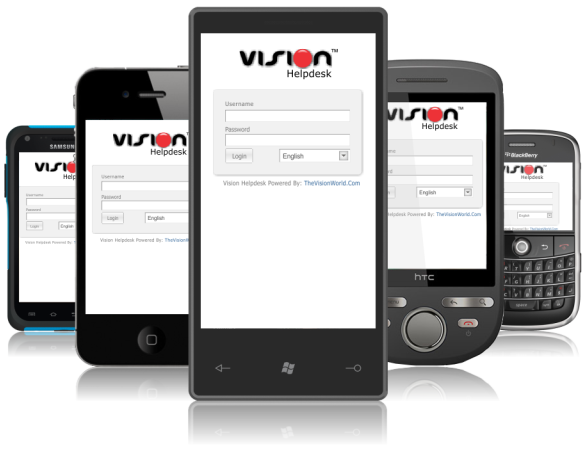 Considering this we have released Vision Helpdesk’s V3 Mobile Version – Vision Helpdesk’s Mobile Version is designed specifically for use on mobile devices featuring low graphics and optimised pages for small screens. Now your staff can access or solve tickets even while they are on move. The mobile version of Vision Helpdesk V3 is not a complete replacement of Manage Portal though it will allow your staff’s to perform operations like Tickets Summary, Tree View Listing of Companies, Departments & Ticket Statuses, Open New Ticket, Reply Tickets and the new exciting feature Blabby. The mobile version is light weight and runs smoothly on all available mobile browsers. This time for V3 we have planned to develop Mobile Apps for various mobile operating systems like Iphone, Android, BlackBerry, Windows 7 phone and more.. We will keep you posted further..
As always we are waiting for your comment / suggestion / feedback on V3 mobile beta version..
You should better focus on the mobile app versions. Browser access on Phones is cumbersom and not easy.